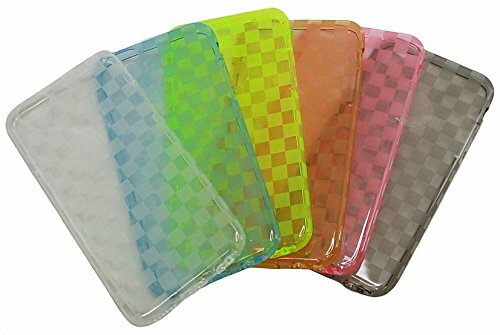 Semi transparent cover enhances your iPhone with a cool checkboard pattern design to match and accentuate the beauty of your phone. Keep your smartphone safe and secure with Chiefmax Premium iPhone cases. Chiefmax has designed the perfect cover for your Apple iPhone 6 Plus. Made from hybrid material called TPU (thermoplastic polyurethane) which is a combination of hard plastic and soft silicone. It provides the flexibility, softness yet hard and solid to maximize protection. Cool pattern design really catches the eye to make your phone stand out. The semi transparent cover highlights your phone's beauty while protecting it and showcasing your phones personal style. Giving you the benefits of protection to provide without the additional weight. You'll hardly feel the difference. You'll be able to access all your ports, buttons with ease. Perfectly constructed to fit around your phone to maximize protection to both your phone's screen and body at the same time. Molded to fit your iPhone 6 Plus. Specially designed to reduce the amount of scratches, fingerprints, dust and residue that is left on your phone, with anti slip grip to prevent slippage.